Cicadae hang from the side of the house and buzz incessantly. The humidity was well over 85% and the daytime temperature hadn’t cooled less than 95 degrees during the several weeks, with a sticky 75 at night. Clouds meander by, but they only tease and laugh at the thought of actually emitting any rain. Even the bugs, fluttering in the evening shafts of light, seem to slow meander rather than their typical darting to and fro. Too hot to move about much. Too sticky to stay in one place. 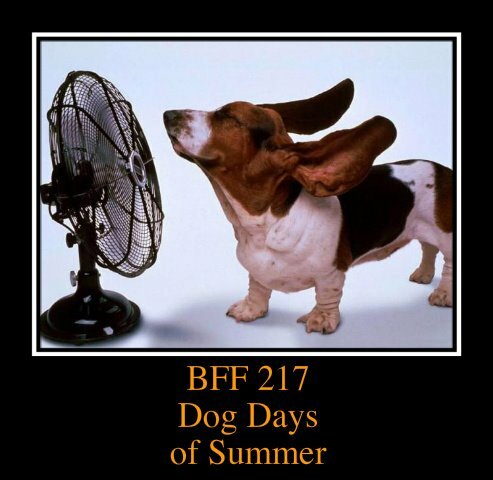 August, the Dog Days of Summer. It would have been a grand year, had there been enough rain. The spring planting season came earlier than normal. “Corn, knee high by Fourth of July” has always been a rule of thumb. Fourth of July came, the corn was easily thy high. Bright green and beautiful. There had been some rain in the spring of the year. Spring was a long hot summer gone by. The smell of barbecue, from one of the many neighbors, wafts in the air. Dogs too hot and tired to bark at the passersby. The walkers have become few and far between, during daylight hours. The walkers, those brave enough to walk outdoors, tend to shuffle down the walkways in the less heavy darkness. Grasslands too burned by the sun to offer nourishment, the wildlife is forced into neighborhoods to forage: hastas are eaten by the deer, flower petals are plucked by the flocks of turkeys, and the rabbits are making their food source the grasses grown in gardens for decoration. Fox are laying dead on the side of the road, forced to move into urban areas to hunt for the mice who moved out of the field. On the cooler nights, the local skunk has had to make his “rounds” far more frequently to scavenge for food. Laying his scent as he moves about, I pity anyone with open windows. It’s almost too hot to hold a conversation. I watch a man jog by. Shake my head and think he is a heart attack waiting to happen. Start to let my mind wander. “Corn is five ears for $2.00. TWO DOLLARS FOR FIVE EARS OF CORN?! Growing up, we leased land and grew corn. We could sell it on the corner to make money for school clothes. Dollar a dozen, two dozen gets you two bakers dozen! “ I would sit on the top of a hay wagon, loaded with bales of hay, wearing my daisy dukes and a crop top. We sold all the corn we had that year. It was almost as hot as this year. Hot an steamy. The neighborhood kids are getting bored with their time away from the regiment of school. They miss their other friends, tired of playing with the locals who aren’t the same age. They begin to get into trouble; kicking underground sprinkler heads as they ride by on their bikes, running into a neighbor’s garage door with their bikes and putting nice dings in it, teasing the dogs who are tethered in front yards, and screaming as loudly as they can as they race downhill on their bikes one after another. The Dog Days make me remember, make me take notice, implant permanent visions in my memory better than any other time of the year. Memories I treasure and hold close. Visions I get to take with me everywhere to bring up during the frigid days of winter. This is most beautifully written. It's like walking around inside your head. That's a fun place to roam, by the way. I'll TRY to leave the lights on for you!! Please don't stumble, my insurance won't pay much!! lol!! To fun. Wonderful memories of summers gone by!! It reminded me of my Grandma who always sold sweet corn and produce at a roadside stand at her house. We have to heap up the warm weather memories for the audacious cold winter we should be having! Thank you for taking the time to read my story. Awesome post. It is realistic and if feels like I was right there while reading. Love it! Thank you Ms. Darlene! It means a lot to me that you have taken the time to read my posts. Thank you.